Welcome to the first installment of a brand-new category: “Adulting!” (Word first penned by the glorious Kelly Williams Brown; her book Adulting is seriously one of my favorites). I know I have a category entitled “College,” but I think it’s time to begin writing about my misadventures in the adult world. I have never worn “real” clothes for an extended period of time. Let me explain. I was a Catholic school girl throughout my primary and secondary years; I experienced K-12 in more or less a plaid skirt and an assortment of polos and pinafores. When I arrived on the college scene, I was a college athlete who was fortunate enough to get a whole different kind of uniform–team t-shirts, team sweats, team shorts, team shoes, team everything. Most days I wore athletic gear to class, give or take the few “cute” outfits I would wear on the weekends or a precious day off. I could get away with just having a few favorite items in my closet. At Disney I wore my blueberry costume on the daily; on my days off I would wear my Disney-fied tanks and a few Disney bounds and my worn Tevas. Of course I knew the answers to the questions above. I’ve looked at Pinterest; big-girl jobs require big-girl clothes. I had a few things, sure. A skirt. A few plain tops. One pair of black ballet flats that I really do adore. I just didn’t feel Pinterest-worthy. The challenge of my two new jobs was not the job itself–I knew I would learn my way around the offices and find my voice. I found the challenge was figuring out what to wear. Shopping commenced. The other challenge: find budget-friendly items because your home girl wouldn’t be paid for another week or so. That’s when I discovered the beauty of purchasing a few key items in which you could mix and match with the stuff you already own. I found a gorgeous dress to pair with a black cardigan, a black skirt to pair with a variety of tops I own, and a poncho that was just too good of a deal to not pass up. It also reminds me of the flying carpet from Aladdin. That was possibly the deal-breaker, but we won’t say it was. All outfits could be paired with my ballet flats I love so much. I think I’ve started building a pretty respectable adult wardrobe. If you’re having trouble putting together a respectable adult wardrobe, don’t fret my friends. I was able to put together something decent and survive a whole week of work. I also have some pretty cute things to wear for the coming week. I hope you have a wonderful week, friends. Crush the adult world. Do all the adult things, like laundry and organizing and conquering tasks at work. I know I’ll be trying to. I love books that help me feel as if I am normal. I received a few of these kinds of books for my birthday last week, and I wasted no time in reading two of them cover to cover. These were just the first two that I picked up to be read eagerly, hungrily, and obsessively: Don’t Worry, It Gets Worse by Alida Nugent and Mindy Kaling’s (I am just now discovering how awesome she is…how am I just now discovering this?) Is Everyone Hanging Out Without Me? (And Other Concerns). I have a very talkative inner voice, as you can tell. Lets start of with Don’t Worry, It Get’s Worse. This style of writing–honest and funny and just plain awesome–continues throughout the entire book. There are moments that bring the audience back to heart of the book: what it feels like to be a twenty-something and struggling to find the balance between careless youth and thriving adult dominate the subject matter, but Nugent mixes in hilarious asides that exaggerate the awkwardness we all feel as ignorant “grown-ups.” There are chapters that are mostly rid of the jokes, but that doesn’t make them any less poignant and memorable. 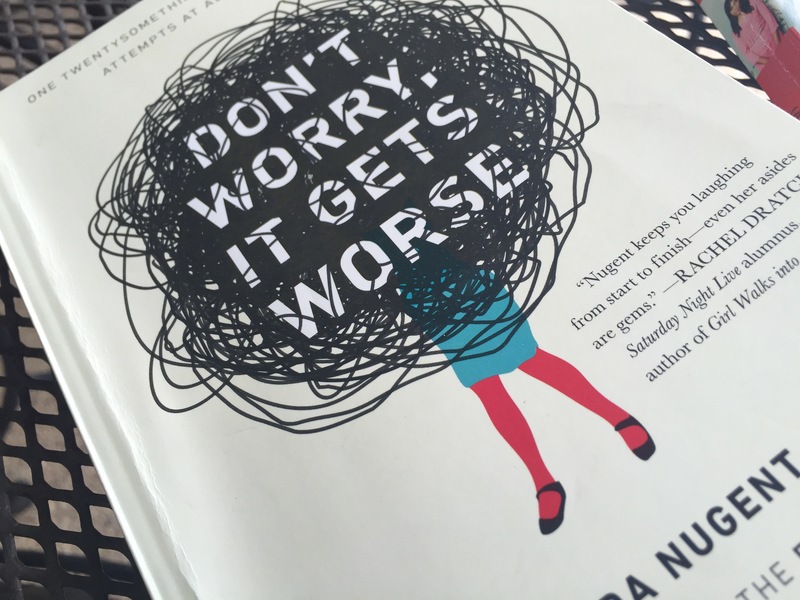 My favorite chapter has to be “On Panic, or Conquering Fear Like a Child.” She recounts her struggle with recent panic attacks and compares it to her fear of sharks when she was younger. She was deathly afraid of those monsters of the sea until a fateful trip on Universal Orlando’s Jaws-themed ride. Once facing her fear, little Nugent wasn’t as afraid. At the conclusion of this chapter she decided that instead of masking her anxiety problem with pills and failed attempts of yoga and alcoholism (you just got to read…she does an excellent job of making light of scary situations) she decides that in order to conquer her fears, it was just time for her to just get in the water and take life day by day instead of incessantly worrying about the unknowns. I loved this book. Do me a favor and go buy it. I’ve always loved books written by the textbook “funny” women of the world: Tina Fey, Amy Poehler, Ellen DeGeneres, ect. Even though I had loved these books, I never really felt a deep connection to any of these women; there were no “She’s just like me!” revelations. 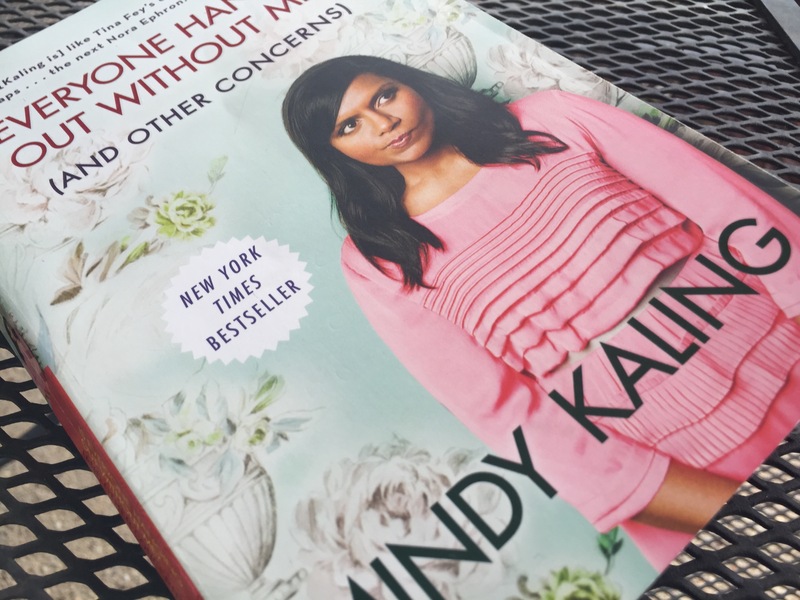 Mindy Kaling changed the game for me–I feel as if I am very much like this adorable Hollywood misfit after reading her book. Kaling grew up in a normal home, attended Dartmouth, failed miserably at a few jobs, and seemed relatively normal throughout her life, even after she found success writing and acting on The Office. Normal in the sense as no drugs, no underage drinking, and all of the awkwardness accompanied by adolescence and twenty-somethingness. She says in her book that her group of friends were the type to talk about going to grad school when they were only freshman in high school–she grew up relatively sheltered, as did I. Being sheltered, however, didn’t stop her from writing one of the funniest and relatable books I’ve ever gotten my hands on. I loved this book, and I makes me want to binge watch every project she’s ever worked on. I even want to get my hands (or eyes) on the production of her first sort of success, her two-person play entitled Matt and Ben. You rock my socks off, Mindy Kaling. There you have it, folks. While everyone thinks they’re odd and out of sorts every once in awhile, that doesn’t mean that there isn’t someone out there who is feeling exactly the same way you are. Picking up these two books helped me understand this, so I highly recommend them to you.